56 / the tasting panel / march 2017 IN THE BIZ "W hen I moved here 20 years ago, it was a pretty good restaurant town, but it's ridiculous how much it's grown," says Bill Netherland, Wine Director of Hospitality Management Group, Inc., speaking about his adopted home, Charleston, South Carolina. "It's renowned as a foodie town." Indeed, Charlestonians have myriad fine-dining restaurants to choose from in their charmingly preserved Colonial-era enclave. High on the list of destina- tions are those owned and operated by Hospitality Management Group, Inc. (HMGI), strung like a set of pearls along historic East Bay Street and under the supervision of Culinary Arts Director Don Drake. When it opened in 1990, Magnolias set the culinary pace for Charleston and for the entire South; its "Uptown Down South" motto (also the name of its well-received cookbook) still embodies the city's gustatory sophistication. Not far away, Blossom offers South Carolina Lowcountry cuisine—read: urgently fresh seafood with sides of creamy grits and rice. Cypress, just next door, is the domain of charcuterie-savvy Chef Craig Deihl; across town, he also heads HMGI's Artisan Meat Share, a CSA-like concept that evolved into a casual sit-down shop. As Wine Director for the entire group, Netherland has unique challenges. But then again, he has a unique back- ground—and 30 years of industry experi- ence—to qualify him for the job. As a military kid, he lived in Germany for three years and then went to high school in Northern Italy, where he became exposed to the intimate connection between food and wine. Higher education at the University of Southern California and the University of Maryland eventually led to a career in restaurant management, where heading various beverage programs stirred a particular passion for wine. Netherland is a Certified Sommelier and a Society of Wine Educators member and currently serves as the Wine Chair for Charleston Wine + Food festival. Netherland admits that with three lists to manage and three bottom lines to keep an eye on, his job is "an administrative beast. Something's changing every week," says the Wine Director, "usually driven by supply. I hate to have wines listed that I won't be able to get again. I don't want to have a large 86 list." His goal is to "have some things that people have a comfort level with—but interesting wines." Recently, that could mean anything from a Kerner from Alto Adige or a Chinon Rosé to top-tier Chardonnays from Peter Michael and Kistler. "I try to keep a microcosm of the list sold by the glass," says Netherland. And the res- taurants' signature "glass.half. full" program offers the same wines by the glass, by the carafe or by the bottle, making selections more widely avail- able to guests. "I like to tinker with the delivery system," says the Wine Director, "glass, carafe or bottle—all aggres- sively priced." He implicitly trusts the well- trained management and wait- staff at the HMGI restaurants to sell and serve the wine: "They can get a 50-year- old cork out of a bottle with no problem." Despite the seasonality of the cuisine at the various restaurants, Netherland doesn't scramble to follow each and every new dish added by the respective chefs. After all, he says, "the chefs don't come to me when they're going to make a menu change." The bottom line for Netherland: "Well-made food and a well-balanced wine list will always go together." PHOTOS COURTESY OF HOSPITALITY MANAGEMENT GROUP, INC. Balancing Act Bill Netherland Says . 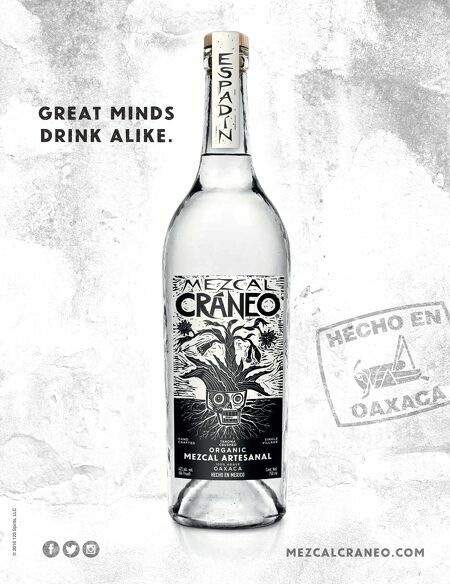 . . "What I drink at home is generally from the Old World—something that has some transparency. Etna Rosso, wines from Piedmont, Burgundy and the Loire. Chenin Blanc is about to gain traction outside Vouvray." "I'd like to have more half bottles, but they're not in regular supply; they don't make them in such production amounts that you can have continuity. I'd like to grow that part of the program." "Champagne has lost its value in perception for the con- sumer—expensive Champagne 'evaporates' when it's served. The value in Champagne is in grower Champagnes, because they don't have those huge marketing budgets. Other sparkling wines— Prosecco, Cava—offer lots of value in the middle-priced category." 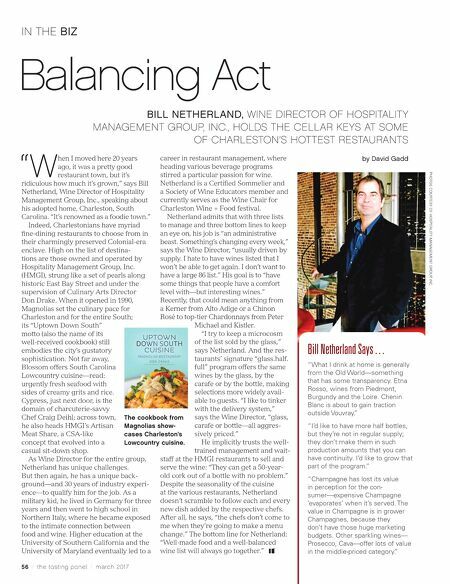 by David Gadd BILL NETHERLAND, WINE DIRECTOR OF HOSPITALITY MANAGEMENT GROUP, INC., HOLDS THE CELLAR KEYS AT SOME OF CHARLESTON'S HOTTEST RESTAURANTS The cookbook from Magnolias show- cases Charleston's Lowcountry cuisine.